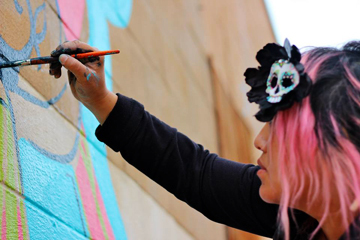 “ Make Common Spaces Great Places” is a project that seeks to spotlight what is possible in public parks and green spaces, through the creation of demonstration sites and events that celebrate placemaking and the importance of community gathering spaces . 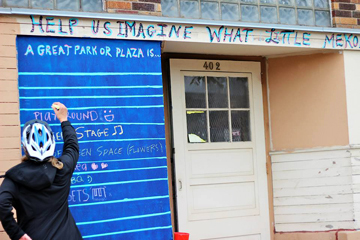 “Paint the Plaza” is an art activity set at the St. Paul Meat Market Site, on the parking lot of Mai Village. 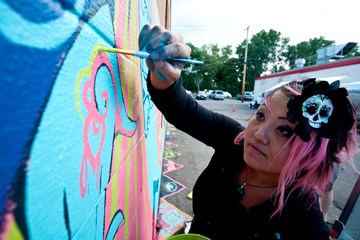 The public is invited to join Mural/Pavement Artist Kao Lee Thao and members of the CHAT (Center for Hmong Arts and Talent) Leadership Team in the painting a plaza design on the pavement. This event is a commission by Irrigate Artist Organizer, Soozin Hirschmugl and Green Line Parks and Commons Initiative, and AEDA (Asian Economic Development Association) to celebrate and spotlight the importance of community gathering spaces along University Ave.
Puddle jumping sums up my background properly. I’m continually sucked into one path after another. I started seeing a pattern echoed through each, people and people’s minds fascinate me. Needless to say I spent half my life studying psychology dreaming to become a psychiatrist and unwrap people from the inside out. Unexpectedly a reoccurring dream urged me to abandon psychology and pursue my childhood passion of art. After studying people’s desires for so long, to ignore my own would have been foolish. I left the psychology world behind and dove head first into pursuing my art interest.